Ever wonder what it’s like to make your major league debut? Find out here as Steven Wright shares with us some stories from his first tastes of the major leagues. 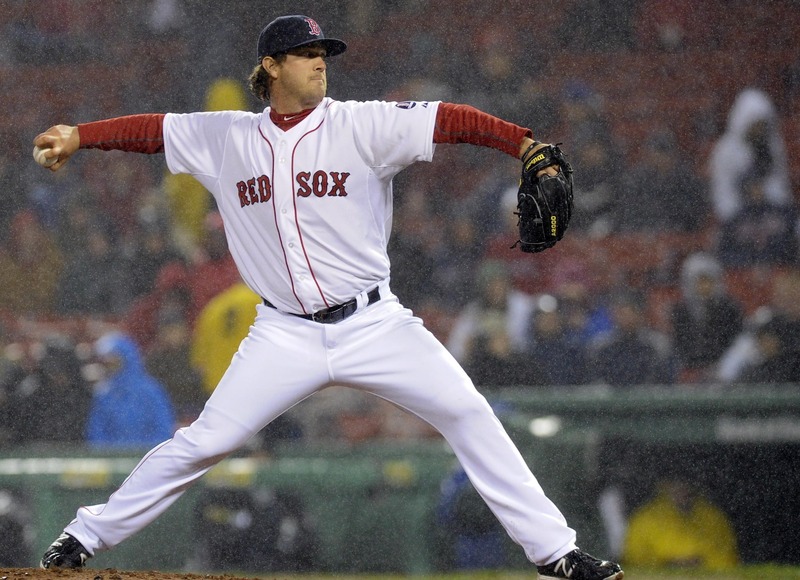 As the 2013 season got underway, we had the opportunity to feature Boston Red Sox prospect Steven Wright (Chasing The Dream – The Steven Wright Story and Interview) . We recently caught back up with Wright as he recovers from late off-season surgery and discussed his 2013 season and whats ahead 2014. Wright made his debut on a cold and rainy night in Boston. During his 2013 campaign the knuckleballer made his major league debut. The Red Sox placed relief pitcher Joel Hanrahan on the disabled list and Wright joined the Sox in Cleveland. Wright, who was drafted and spent most of his career in the Indians system had always in-visioned he would make it to the big leagues in Cleveland. Little did he know at the time it would be with a different team. Wright was used out of the bullpen and made his major league debut a few nights later against the Oakland Athletics. In less than ideal cold and rainy conditions, Wright replaced Alfredo Aceves in a rain shortened game. Wright was able to get the first batter he faced, Brandon Moss to ground into a double play. That officially got Wright on the Major League stat sheet. Wright would appear in relief with the Sox on two other occasions during the season and in August made his first big league start against the Houston Astros. In his four major league appearances, Wright managed to pick up two major league wins. When he wasn’t in Boston, Wright was a mainstay in the Pawtucket rotation. He made 24 starts for the team compiling an 8-7 record while going the distance in three of those games. In the off-season Wright suffered a sports hernia injury that required him to get surgery. Wright’s injury occurred late in the off-season and he is expected to be out until sometime in May. He is currently rehabbing the injury and working hard to get back on the mound where he will be ready to help the Red Sox in any way if called upon. 1. You made your major league debut last season. Tell us how you found out the news you were going to the majors? It was a crazy situation. I had originally been told I was going to skip a start cause they weren’t sure what was going on. A few days later they told me I was going to start the next day. That next day is when the Boston Marathon bombing occured. I got called into the office right when the news broke of the bombing. That’s when they told me I was going to go up to the majors. They told me I couldn’t say anything however because the move was not public yet. The next day I flew into Cleveland but the move wasn’t officially made until they put Joel Hanrahan on the disabled list. So I really didn’t get to share and tell anyone except my family. 2. What was the feeling like to walk into the major league clubhouse and see your locker with your jersey? Its pretty surreal and it just so happened to be when I was in Cleveland were I spend pretty much my entire professional career. It brought back a lot of memories from the times I spent there in rookie development camp as we used the visitors clubhouse and I knew the clubbies from the time spent there. The only difference was I had a Red Sox jersey and I was there for a game. It’s definitely a different feeling looking around and having Bailey next to me, then Lackey, and Lester. To see these guys and to be playing an actual game with them. It really kicked in when I went outside, I got drafted by the Indians and came up with the Indians and that’s where I wanted to make my debut. That dream came true just with a different team. 3. You made your debut vs the Oakland A’s. What do you remember most about your debut that day? It was cold, rainy, and windy but I had so much adrenaline. I had warmed up the night before so my adrenaline wasn’t as high as it was the day before warming up but I still had a lot of adrenaline. The weather was so bad that I was just trying to get the ball over the plate. The ball was slipping but the pure excitement is hard to even explain. 4. You received and proudly displayed your World Series ring on twitter like many of your teammates. How does it feel to be a part of a World Series championship team? It was amazing. I wasn’t there during the playoffs so I got to watch the series on T.V. like everyone else. The Red Sox flew me up there for the ring ceremony and that’s when it hit me. They called me out to get my ring. This is what people play for, every year there is only one team that gets rings on this day. It was cool to see every get their ring, its such a high accomplishment. There is so many big name players that have played 20 year careers and they never have gotten a ring and here I am getting one in my first year. 5. You had a busy 2013 season, between making your debut and receiving a World Series ring. Whats did you take away from your 2013 season? Just being in the big leagues in general. Just getting there, each time I was up there I was able to learn a little bit more about what it takes to stay there. Now I know what it takes to get there and what I need to do to be consistent to stay there. So just being up there and learning and watching, knowing what it takes to stay there and be competitive everyday that’s what I learned the most. 6. You were injured in the off-season, tell us how the rehab is going and when you think you’ll be back on the diamond? I’ve been throwing, I have a bullpen tomorrow and then text week I think I will start throwing some live batting practice. Its coming along slow but it’s coming, first time I’ve ever been hurt in my career. 7. Once you get back on the mound, what are your 2014 goals? Once I get back into games just commanding the strike zone, one thing I didn’t do as well last year that I did the year before was throw strikes. I know I throw a knuckleball but for me, I need to pitch to contact and throw the ball over the plate. It’s the complete opposite of what you want to do when you’re a conventional pitcher. I need to pitch to hit the bat not miss the bat. That will allow myself the opportunity to go deeper into games. A special thanks to Steven Wright for once again for taking some time out of his day and rehab to answer some questions. We look forward to following him all season long once he returns to the mound. Please give Steven a follow on twitter @knucklepuck23 and like us on Facebook and follow us on twitter @CTD_Sypien as we continue to feature and follow all of our featured players as they chase their way to the major leagues.